There's a reason why K-Motion has quickly become the #1 Kinesiology Tape in Bowling. 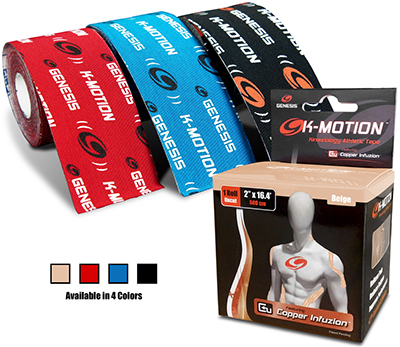 With Copper Infuzion, it's the Most Advanced Kinesiology Tape on the Planet! K-Motion un-cut rolls give you a full 16.4 feet of our advanced, easy to cut, copper infused material to handle whatever your taping needs may be. On a roll, it's perfect for people who frequently use smaller pieces of tape as well as for those who require taping techniques where longer lengths are needed, such as the torso, legs or when treating sciatica. Pro Tip: To prevent fraying during use, always round the corners when cutting. Using a quality pair of scissors is recommended. Big or small, you cut to your own personal size or shape. Always round the ends!